Your coolant system is what keeps your car engine from overheating in the summer and from freezing in the winter. It works by coolant being pumped by the water pump through the engine into the radiator. The coolant takes heat away from the engine and dispels it through the radiator by airflow that comes through the grill of the car. If this system breaks down or isn’t maintained it can cause damage to your water pump. This damage over time will affect not only the coolant system but also your engine and engine’s performance as well. Why Get a Coolant Flush? 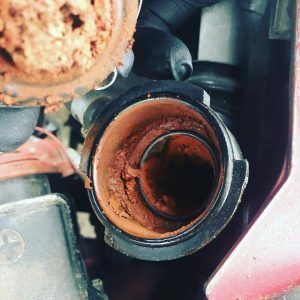 This is what happens when you neglect your cooling system, gunk and harmful deposits build up in your radiator and can cause damage to your water pump/cooling system. Getting a coolant flush is absolutely necessary for a car’s regular maintenance. Getting one every couple of years helps clear away the gunk and sediment that has been building up in your car’s coolant system. You can see in the photo that this buildup of rust and other gunk will make your car’s co0ling system fail. So getting a coolant system flush will improve the efficiency of your car. In the process, it will also replace old coolant with new better performing coolant. How often should you flush your cooling system? Mr. Muffler is your local go-to local mechanic for all your car or truck service needs. We perform oil changes, brake repair, complete exhaust system installations and repairs and custom exhaust system design. We want to keep your car on the road, which is why we offer coupons and deals for you every day. Stay up to date with all our specials and deals by following us on Facebook or Instagram!